The conference was jam packed with around 500 delegates and over 50 leading international and local investment professionals. The conference facilitated debate on the markets, strategies, and investing, with a particular focus on the friction between short-term and long-term investing imperatives – and the portfolio construction decisions that must be made. Theory tells us that investing is supposed to be about the incremental replacement of human capital with financial capital over the long-term. Every day, the theory is challenged however, by human beings’ behavioural biases, fuelled by the 24/7 news cycle, which encourages shorter and shorter cycles and thinking. The question remains a valid one, is the concept of long-term investing increasing irrelevant? The human brain is a natural wonder and a very powerful processor – producing more than 50,000 thoughts each day and 100,000 chemical reactions each second. Yet our judgement is quite inaccurate. Our brain’s reliance on short-cuts wreaks havoc by forcing us to make poor irrational judgement. The tendency to do what everyone else is doing, especially in difficult or uncertain times. It illustrates how we like to make decisions based on what feels good (doing what everyone else is doing), even if they’re poor alternatives. The tendency for people to want an immediate payoff rather than a larger gain later on. Or the desire for instant gratification. If we can learn more about how we’re wired, we may be able to see through the knee-jerk, emotional, and irrational decision making and focus on the long-term game. We live in uncertain times. Markets are volatile and events are unprecedented – or at least that’s what we’re told and have been conditioned to believe. The truth is a bit different. It’s true that we live in uncertain times and markets are volatile, but they always have been and they always will be. Investors should build their portfolios based on facts and evidence, not on conventional wisdom derived through sentiment, so as to navigate financial markets over the long-term based on knowledge of data, not conjecture. In this day and age, we’re super lucky to have such a large data set to help us make better investment decisions. Today, markets are extremely uncertain. Why? Because we can’t see far enough ahead into the future. We can’t be blamed, we’re not wired for it. I’ve done some research and analysed the returns of the Australian stock market from the short-term right through to the long-term. I’ve also included in this analysis the best and worst returns for these same time frames. The data is from 1980 to July 2016 – the longest data set I could get my hands on for the Australian share market. The table above summarises the average annual return for each period, as well as the best and worst annual return for the same period. As an adviser and investor, I pay close attention to the potential downside to an investment as part of my investigation. In the table above, I note the high level of uncertainty via the downside/worst return during short time frames (1, 3 and 5 year). Push the time frame out to 10 years and see how your downside/worst return transforms to a positive 5.69% pa for 10 years – the worst return! Although over long periods of time the behaviour of different asset classes may be somewhat predictable, the way they behave during shorter time frames can be very unpredictable and sometimes quite frightening. For these reasons, when deciding on the mix of your investments, it’s essential to understand the behaviour of different asset classes. This time is not different. Traditional portfolio management tells us to mix your stock portfolio with bonds, because although stocks give us long-term growth, bonds provide diversification by providing stability and liquidity for when things go wrong. Given the current interest rate landscape where more and more governments around the world are issuing bonds at negative yields, investors are questioning this relationship. Maybe in this new paradigm, investors should be asking themselves how stocks can help diversify their bond portfolio. Which begs the questions, what happens to stocks when bonds lose money? Throughout the 88 years, bonds experienced a loss 16 times. In just 3 of those years, stocks were also down. History tells us that more than 80% of the time when bonds have experienced a loss, stocks have been up – and on average with a pretty decent spread. Throughout the 88 years, bonds have lost money 37 times, or roughly 42% of the time. During those 37 years, the stock market was down only 12 times, which means stocks have returned a positive return almost 70% of the time when bond returns were negative. The data tells us that stocks do in fact help diversify away from bonds. Right now, we’re seeing both the stock market and bond market rise in value. Understandably, investors are concerned that both asset classes may decline in value. If history is any guide, and that bonds are inflated, stocks are a pretty good to place to be. Is the concept of long-term investing increasing irrelevant? I believe long term is only as relevant as one’s personal horizon – there goals and aspirations. For some, long-term may mean the next 5 years, for others, it’s a generation. There is no right or wrong answer. Carefully scattered from Southwest of Japan to Taiwan are a chain of Japanese islands. The Ōsumi, Tokara, Amami, Okinawa, and Sakishima Islands (further divided into the Miyako and Yaeyama Islands), with Yonaguni the southernmost. The largest of the islands is Okinawa – where an old Japanese diet has something very common to the world of investing. Okinawa’s population is said to include the largest proportion of centenarians in the world. In fact, the Chinese have referred to Okinawa as the land of the immortals for centuries. For almost a thousand years, this Pacific archipelago has maintained a reputation for nurturing extreme longevity. Okinawans over the age of 65 enjoy some of the world’s longest life expectancies. They suffer only a fraction of diseases that kill many: 1/5th of the rate of heart disease, 1/5th of the rate of breast and prostate cancer, and less than half the rate of dementia seen among similarly aged Americans. Their diet is traditional, its simple, its disciplined, its proven. There are no soup diets, lemon detox diets, Atkins diets, and no 5-2 diets. It’s a lifestyle. A lifestyle for which the benefits are realised over long periods of time. This concept is no different to investing. Boring. Simple. Disciplined. Proven. Let me assure you, the world of investing is not short of any fads either. The decisions you make about the mixture of your assets has by far the greatest impact on your financial success. Typically, conventional investors focus on stock selection and market timing while ignoring the primary determinant of future return – optimal allocation between different asset classes. Attempting to time the market can prove costly and futile. Predictions go awry and ‘investors’ miss the strong returns that markets provide. Unfortunately, more money is lost in trying to avoid a crisis than the crisis itself. Wealth is created over long periods of time and people make mistakes when they try and do it too quickly. It takes discipline and patience to build sustainable wealth. Historically, the equity and bond markets have proven to reward long-term investors, offsetting the rise in inflation. Like your health and lifestyle, when it comes to investing, look beyond short-term fads in financial markets and build an investment portfolio based on more than intuition, forecasts or rumour. Examine market data and investment trade-offs to put the odds of longevity and success in your favour. Australian Property. The Million Dollar Club. The latest data is in. 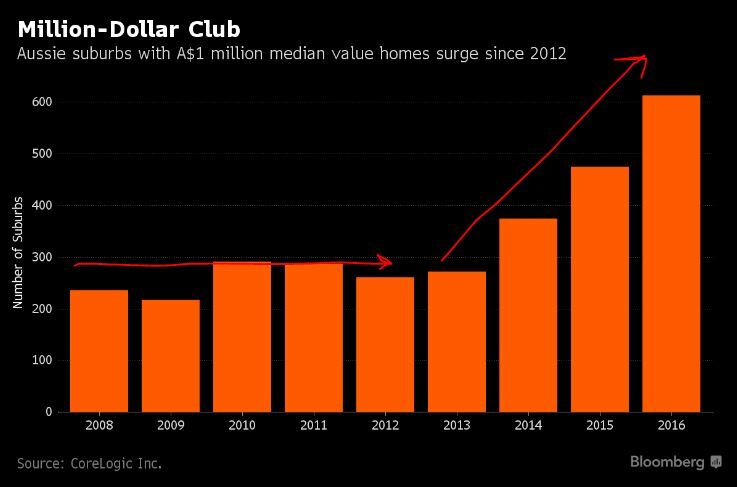 The four year Australian property boom has driven the number of Australian suburbs to command a median house price of $1,000,000. Since interest rates began their downward trend in 2012, the average capital city home price has climbed 40%. On many metrics, housing is unaffordable – for example, using debt to income ratios. 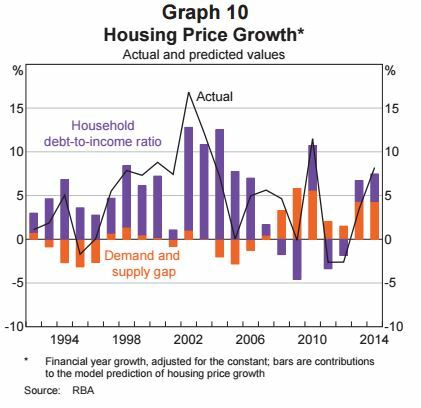 Through the 1990s until the mid 2000s, house price growth was closely associated with changes in debt to income ratios. 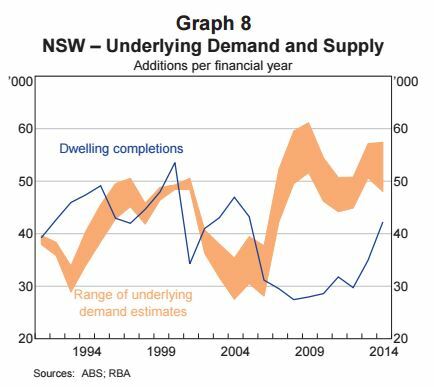 Since the mid 2000s however, it seems as though underlying demand (as represented by the orange bars) have played a more prominent role. The demand gap, or supply, is the most basic and fundamental driver that commentators continue to overlook. Take a look at Graph 9. 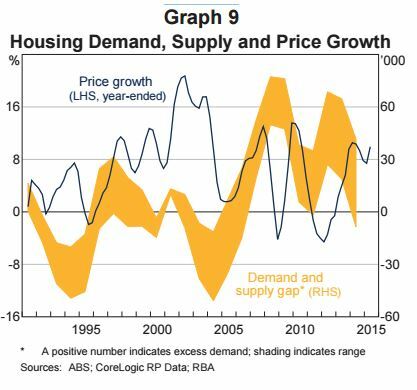 Again, since the mid 2000s, the demand and supply gap has been clearly evident (above zero). NSW arguably playing the biggest role. The last few years have provided home owners and investors with phenomenal returns, realised or otherwise. Again, like any market, on lookers forget to take a longer term view. I mean, look at the last five years of returns. They’ve been anything but phenomenal. Nevertheless, no matter which way you look at it, the cranes continue to do the work. In fact 85% of cranes in use are for residential construction, including student accommodation and retirement living projects. 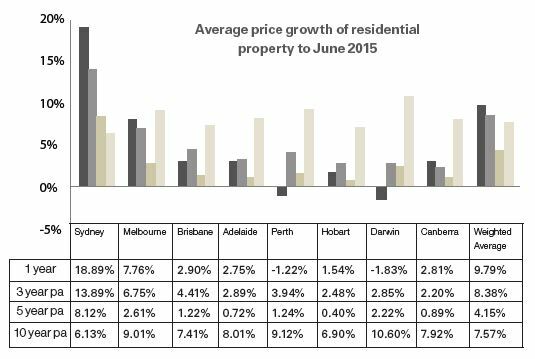 Doncaster and Box Hill continue to be apartment hot spots, through Manningham and Whitehorse. 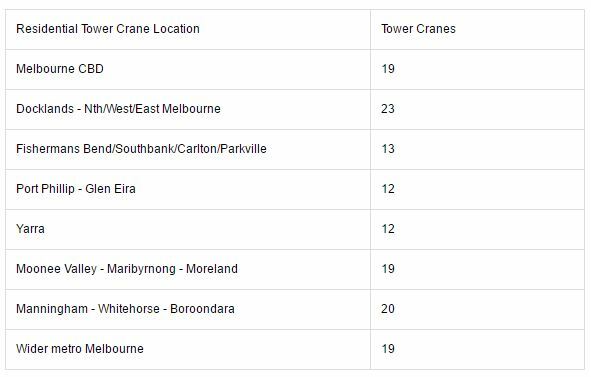 We’re also seeing a number of projects make their way up into the sky in Brunswick East through Moonee Valley – Maribyrnong – Moreland. The construction that is going on is high density stuff. 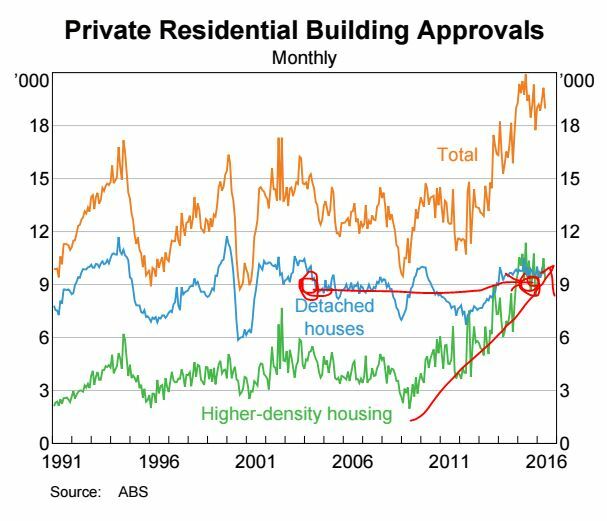 You’ve seen this chart before, which clearly distinguishes the activity in higher-density housing and detached housing. There’s been limited activity in detached housing since the mid 2000s. Again, like most investments, they typically revert to their mean. Property is no exception. 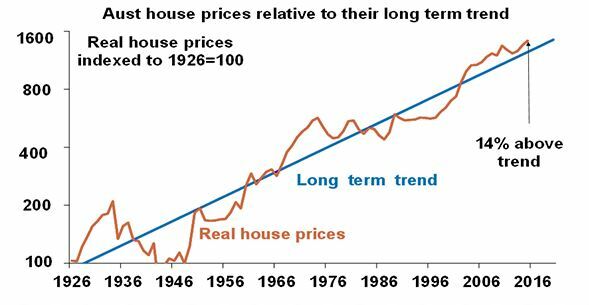 AMP have a great chart they update regularly (below), which shows us real house prices relative to their long-term trend. Sure, residential property may seem expensive right now. There are many factors driving this. 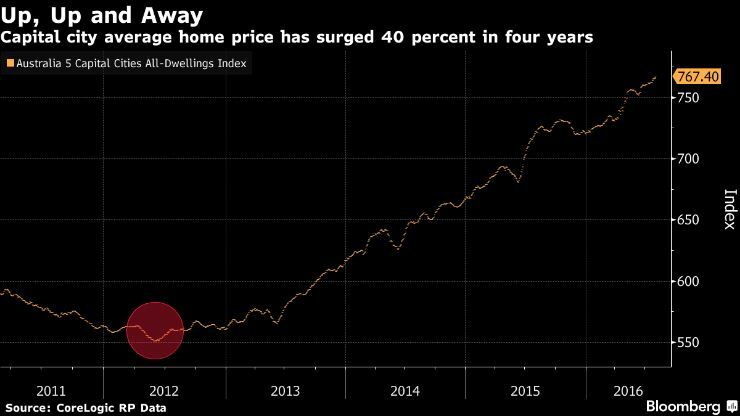 In my opinion, a fierce combination of low interest rates, continued immigration and foreign investment, and an under supply of dwellings are driving prices higher and higher. This will no doubt change. Markets have an uncanny way of adjusting prices. I encourage you to make investment decisions that are right for you and your personal goals, aspirations and priorities. I strongly encourage you not to make decisions based on speculation and simply in the pursuit of money. Money is not the end game (although for some it may be), it is simply a means to an end. Be clear on the ‘end’ and decisions with money will become much clearer to you. John Maynard Keynes once famously said, “markets can remain irrational for longer than you can remain solvent”. It’s a Bull Market. Right Mr Trump? It’s easy to look back at events that unfolded and kick ourselves for not seeing the impact it could have. Whether it’s in our personal lives or in financial markets. Having recently attended a number of investment forums, I’ve been hearing more questions about the current state of world stock markets and the impact the duration of this bull market, valuations, and US Presidential elections may have on world stock markets. Before I go on, I must make it absolutely clear that the information contained in this note are simply observations made looking back in history. I don’t have a crystal ball and am not making predictions about the future. After all the doom and gloom, here’s where the world’s largest stock market is at. The Dow Jones index for the last 24 years. Long enough I reckon. It captures a tech bubble, a GFC, as well as the significant appreciation in the stock market following. And even if you invested at the peak of both the tech bubble and GFC, you’d still be ahead on your capital today. Oh, the financial media didn’t tell you that? They say that bull markets don’t die of old age…(insert commentator’s choice of bull market mortality here). Let’s face it, markets look expensive, in absolute terms. The chart below plots the for PE ratio for the S&P 500. 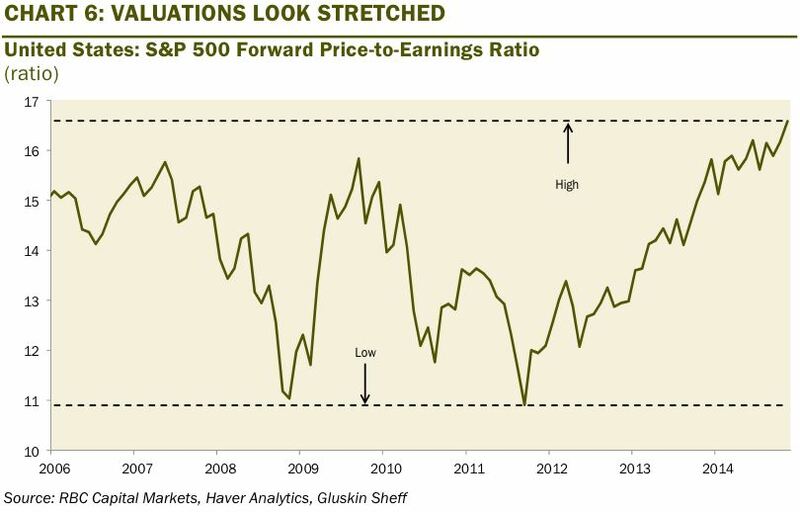 As you can see, valuations look stretched. Relatively speaking however, there is ground to make a case for stocks. Investors should also understand that higher multiples don’t necessarily mean an imminent crash, it simply means future gains are constrained. These are two different events. 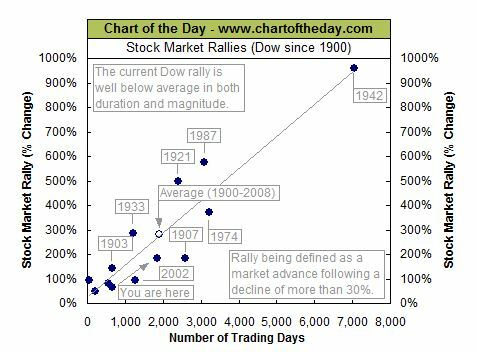 To put things into perspective, the chart below plots all Dow Jones’ major rallies of the last 116 years. Each dot represents a major stock market rally, the year it began, it’s duration and magnitude. Over the last 116 years, the Dow Jones has rallied 13 times, an average of one rally every 8.9 years (which also means there was probably some sort of collapse prior – one every 8.9 years). What’s interesting is the duration and magnitude of the rallies are closely correlated with the linear line (grey upward sloping line). Take a look at where we are today. The rally began in March of 2009 and is the 4th longest on record. Having said this, it’s duration is slightly below average, and it’s return (magnitude) is well and truly below the average. We need to understand that the length of a bull market, nor the multiple has caused the stock market to crash. Never. Bull markets end from excessive monetary restraint and economic setbacks. And here’s the latest from the Republican Party’s Presidential candidate, Mr Trump. In an interview with Fox Business, he was asked if he has money in the stock market. “I did, but I got out”. He warned of “very scary scenarios” ahead for investors. I wonder if he’s referring to himself as potentially winning Presidency – this may be one of them. So you want to know who will become President? Forget the polls and boggle heads speculating and forecasting likely winners, just take a look at the stock market. Why? Because historically, the stock market’s performance in the three months leading up to a Presidential election has displayed a mysterious ability to forecast the winner (thank to Zero Hedge for the stats). Since 1928, there have been 22 Presidential elections. In 14 of them, the S&P 500 climbed during the three months preceding election day. The incumbent President or party who won in 12 of those 14 instances. 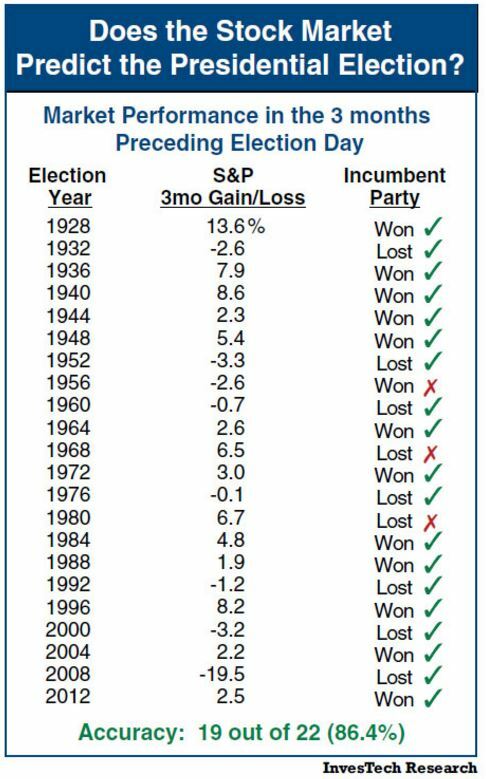 However, in 7 of the 8 elections where the S&P 500 fell over that three month period, the incumbent party lost. There you have it. Statistically, the stock market has an 86.4% success rate in forecasting the election. Your time might just be better spent watching the stock market rather than the ongoing debates and polls. 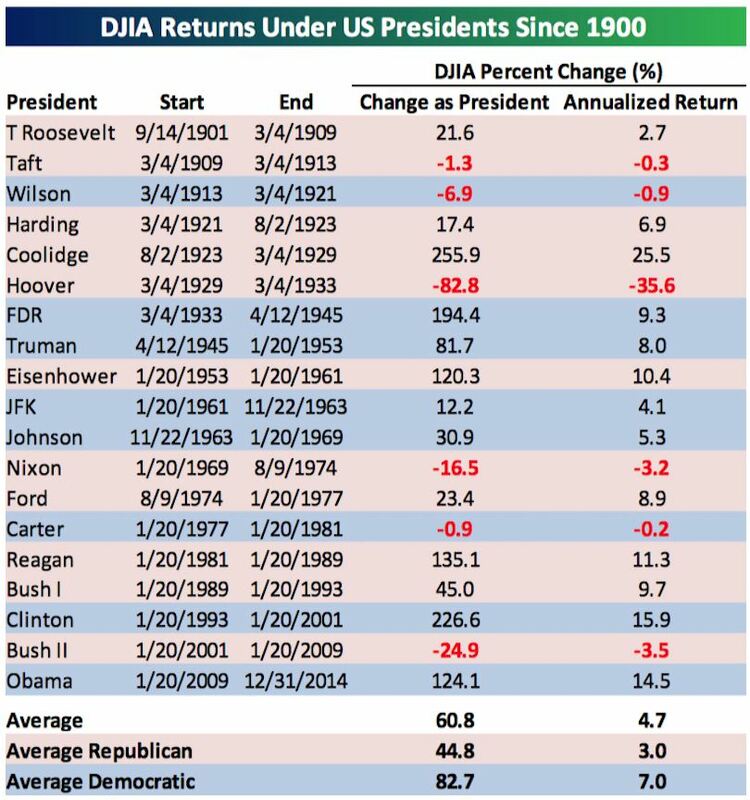 Noting the 82.8% decline in stocks during the Hoover administration, history tells us that the stock market performs better under Democratic Presidents. We’re never going to know when a crash will occur, it’s magnitude, or how long it will last for. No one knows this. No one. Investment decisions should be made with a specific objective. The only time the strategy should change, is if the objective or your personal situation changes. It shouldn’t be based on predictions made in the news paper, or based on an analyst’s report. Investing is a long term game. Just take a look at 3 reasonably aggressive portfolios below. These portfolios are split between defensive (cash and fixed income) and risky (stocks and property) investments – 15/85, 10/90, 5/95. Data is from 1990 to December 2015. Through this time frame, we’ve had recessions, tech bubbles, and a GFC. A decent sample size. The table shows us the average returns for these portfolio over various time frames, as well as the best and worst returns for these time frames. Take a look at the worst annualised return for 10 years – 5.53% pa over a rolling 10 year period. That is the worst return an investor would have received each year over 10 years, and the worst return only gets ‘better’ the longer your time frame (15 and 20 years). Of course, the shorter your time frame, the greater the probability of losses. It’s a bull market. Over the long run. Puts the odds in your favour.